countries together. While the work of the Council doesn’t come with all the bells and whistles of other multilateral institutions, the work that it does is substantive, practical, and of enormous importance to all member states. I look forward to working with my colleagues from Iceland and other member states (Russia, Norway, Finland, Denmark, Sweden, and Canada) . I had the pleasure of visiting Össur, an Icelandic flagship company with large and successful operations in the United States. As a manufacturer of prosthetics, bracing, and support, Össur is a world leader in the design of products that make enormous improvements in the mobility of people. 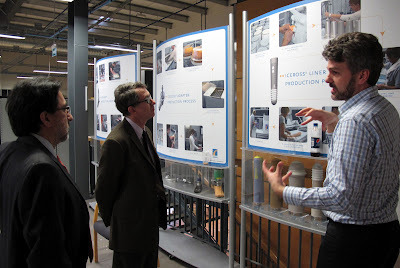 It was impressive to observe the design and manufacture of several of their most advanced products, especially the Power Knee and the Rheo Knee. Össur´s products have made an enormous difference in the life of American wounded veterans and their partnership with communities and the Walter Reed Hospital is commendable. 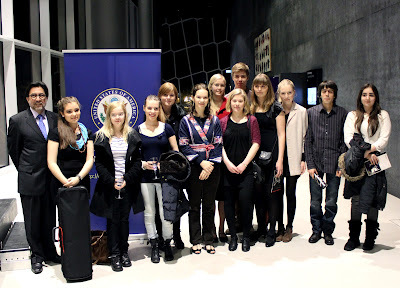 Reykjavik’s magnificent Eldborg Concert Hall at Harpa provided the setting for a wonderful evening of music. We were mesmerized by Hilary Hahn’s virtuoso performance of Mozart’s Violin Concerto No. 4. Hilary is a world renowned American violinist who returned to Iceland to perform with the Icelandic Symphony Orchestra – a world class ensemble. 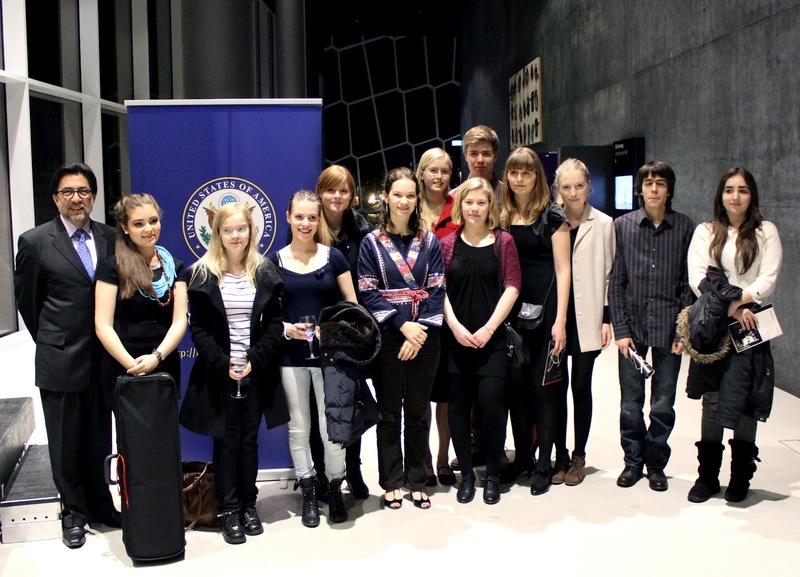 At the end of concert, we hosted a reception to honor Hilary and to welcome a group of talented violin students from the Reykjavik Music School and from the Iceland Academy of the Arts. We were gratified to learn that some traveled a long distance to meet Hilary. The music scene in Iceland never ceases to amaze. This past weekend Mary and I were guests at the closing dinner at this year’s Mid-Atlantic organized by Icelandair. The dinner hosted by Visit Anchorage and the large Alaska delegation that attended the conference. The event was attended by representatives from the U.S., Norway, Scotland, Greenland, Denmark, Germany, Sweden, and the Faroe Islands. Alaskans sure know how to organize great events; they brought Alaska salmon, caviar, reindeer sausage, caramel, and a group of Native performers as well as a few wildlife mascots. Alaska and Iceland share not only latitude but a passion for the Arctic. We hope Alaskan participation at this event will lead to closer travel connections with Iceland. I was invited by NFL Sports Iceland to join a very large and enthusiastic group of Icelandic and some American fans of Football (the American kind) to watch Super Bowl XLVI. It was so great to see so many young people following the sport , enjoying it, and getting really excited about it. And did I mention, so knowledgeable about it as well? In fact, when I looked at the pop quiz that organizers passed around, I must confess that I did not know many of the answers. The locale where the event took place had so many TV screens that there was not a single spot in the place where one would not have a good look atthe game. My gratitude to Sverrir Juli for keeping the American football flame alive in Iceland.